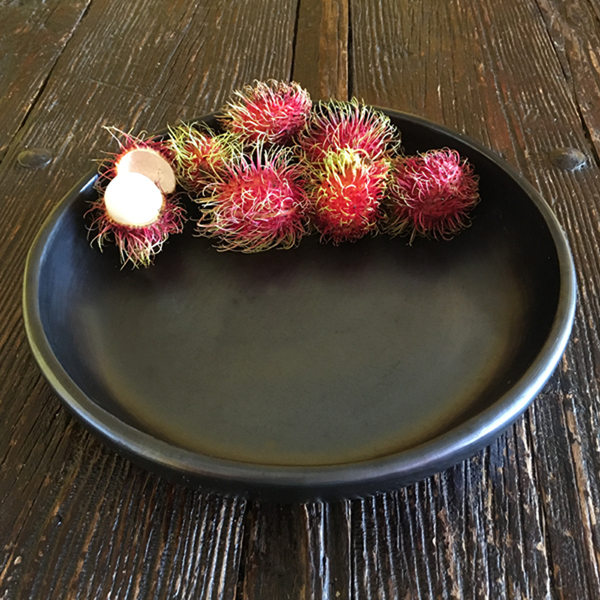 Our Round Serving Dishes have a modern look, which combined with its stark black color, make any dish stand out. Black Clay, La Chamba Cookware, is well-known and used throughout Colombia in restaurants and homes for preparing and serving traditional dishes such as Ajiaco. Its origins can be traced back at least 700 years to vases and pitchers found in pre-Columbian archaeological sites. It is still made in the traditional manner, by families in a small village on the banks of the Magdalena River in Central Colombia. The pieces heat very evenly and retain heat for a long period and can be used in the oven, the microwave or on a gas or electric stovetop. They can go directly to the table for a sophisticated presentation. Because the pieces are unglazed, they are completely natural and safe and contain no toxins or lead. The porous nature of the unglazed clay allows the slow evaporation of steam resulting in using less liquids and fats while cooking which that produces food that is healthier and tastier! Black Clay Cookware is not only beautiful, but it is also quite sturdy and will last many years with proper use and care. The plates can also be used in the oven, in the microwave or a stovetop, and can go directly to the table for a sophisticated presentation. The pieces can be used directly on a gas or electric range, however, it is recommended to use a heat diffuser on electric ranges. The heat diffuser (which can be used with gas stove as well) has the added benefit of distributing the heat slowly to prevent foods from burning. Clay cookware can also be used on induction cooktops with the use of an induction cookware interface disk. The pieces must not be submitted to drastic changes in temperature. The pieces should be allowed to adjust slowly to heat, letting them slowly heat up until they are hot, either on the stove or in the oven. Likewise, you should also allow the pieces to adjust to room temperature before washing or storing them, and never sit a hot pot on a cold surface such as granite or tile. The plates retain heat for a long period of time, so be careful in handling a hot plate. For cleaning, avoid using the dishwasher, hand washing is recommended. Do not use metal or abrasive pads as they may scratch the surface and avoid strongly scented soaps which can flavor the clay. In a small village on the banks of the Magdalena River in central Colombia, live entire families of talented artisans that make Black Clay, La Chamba Pottery. Like their ancestors have done for 700 years. The process of making Black Clay, La Chamba Pottery has remained virtually unchanged since before the Spanish conquest. Still today, there are no mechanical wheels and each piece is made entirely by hand. It is a laborious process of molding, polishing, and firing. The entire community is dedicated to the production of these ceramics and it is how the community sustains itself. Rather than one artisan completing an entire piece, families or individuals specialize in certain steps of the process, which make the creation of each piece an entire community affair. After each step is completed, the pieces are then transported by burros, motor bikes or even on top of their heads to other families or individuals who complete other steps and so on until the pieces are completely done and packaged. Three different types of clays from local mines are used in the making of these ceramics. They are dissolved in water and strained to remove little stones and other impurities. The interior of the ceramics are made with a mixture of a smooth, grey clay that gives the piece its strength and body, and a sandy grey clay that makes it easier to mold. The exterior is then “glazed” with a watery red clay which gives the piece a smooth surface, and allows for the polishing. The process begins by flattening a ball of clay and forming it around a mold specifically made for each model. This “shell” is then smoothed and trimmed using tools fashioned from bamboo and plastic pieces. The pieces are then left to air dry, receiving a light polishing during the drying to make sure they have a smooth surface and free of sand. The pieces are then transported to other artisans that specialize in adding rims and/or handles. The handing off progression continues with other artisans which specialize in the production of the lids, which are custom made for each piece. Even the knobs on the lids are made by artisans who specialize in only adding knobs to lids. After each step the pieces are laid out to dry in the scorching La Chamba sun. Sometimes the process is delayed due to rains which prevent the drying of the pieces. When it begins to rain, the entire community is mobilized to quickly cover drying pieces that were outside in various production stages. The pieces are then lightly polished with a soft sponge to ensure a smooth exterior, and they are then taken to artisans that glaze each piece with the watery red clay. The glaze is not let to dry completely to allow for the next step of polishing, which is probably the most laborious part of the process, the polishing. The hand polish, a process known as burnishing, is done by rubbing the entire piece with semiprecious stones until it has a uniform brightness on the surface. Depending on the size of a piece, the polishing can take up to half an hour to an hour. Originally, this polishing was done with smooth river rocks from the bottom of the Magdalena River, but is now done with agate stones brought from Brazil which are stronger. With use, the stones grind down even creating grooves from corners and edges. After the pieces are polished and fully dry, they are taken to be fired in conically shaped, wood burning ovens, although some artisans now use custom made gas kilns which make the process somewhat easier and faster. To start the firing process, the pieces are placed inside metal drums, with smaller objects first going inside larger earthenware pieces. These metal drums are then placed in wood burning ovens, usually late in the day so as to minimize the heat to the workers. The firing process takes approximately three hours, with the furnace reaching approximately 750°C. This high heat, together with the glazing and burnishing process, result in utilitarian pieces strong enough to withstand rough treatments and make them ovenproof. After the firing comes probably the most interesting part of the entire process and is what gives the pieces their unique black color. The metal drums are pulled out of the ovens with the help of long sticks. Processed vegetable materials in the form of saw dust, rice husks, or other materials are then added to the metal drums with the white hot clay pieces still inside. The materials immediately catch fire and begin to smoke. The drums are then covered to extinguish the flames but keep the material smoking vigorously for quite some time. The smoke penetrates the pieces giving each piece the black color that so characterizes products from La Chamba. The entire village and artisans are extremely proud of their products, as we are bringing them to you.